Editorials from Theslowlane: Heating District For Bellingham? I wonder if anyone is asking these questions? Could hot water, and/or steam from Encogen be used for space heating in the new waterfront development on Bellingham Bay? Is this asset being thought of as a drawing card for locating on the central waterfront? Update May 4th 2011, Bellingham Herald PSE Power Plant Could Heat WWU. There is a co-generation plant on Bellingham's waterfront. 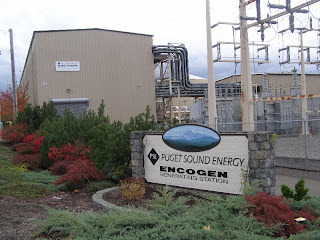 The Encogen power plant currently operated by Puget Sound Energy. At times, steam is still visible on Bellingham's central waterfront. It rises from this power plant. Encogen was built as a co-generation plant; meaning waste heat from generating electric power can be used in nearby facilities. In this case, the use was Georgia Pacific's pulp and paper mills. GP has closed both pulp mill and paper mills. * Paper mill section closed as of mid December 2007. Plans are afoot to redevelop GP's old site for other uses including, possibly condominiums, research facilities, other industries. There is even a branch campus for Western Washington University's Huxley College of Environmental Studies in the dreams. These things, and more, are all in the discussion stage. No one knows the final outcome, but there has been a lot of community dialog so far. Now, I wonder if the co-generation plant figures into any of these plans? It seems like a great opportunity. Waste heat from the power plant can be used in these other plans. If nothing else, at least for space heating. This new waterfront neighborhood will just about have to be rebuilt from scratch. A good opportunity to plan around the distribution of steam and / or hot water from co-generation. There are some historic buildings on the site. Old structures from the pulp mill that may be preserved. Many of them already have steam lines (I would guess) and also one would figure that a lot of utilities will be installed from scratch. Utility tunnels, pipes, wires, what ever. A good opportunity to plan around waste heat distribution. Many power plants just send their waste heat up into a cooling tower. It isn't practical to use that heat, due to lack of uses near the plant. Also there is the cost of running pipes around for distributing hot water. It can cost a lot to retrofit an existing neighborhood. That's why a new neighborhood provides an opportunity. Bellingham's waterfront may be rebuilt from scratch and it has an existing co-generation facility. I remember some people talking about piping waste heat from Alcoa Intalco Aluminum to Bellingham. That "pipe dream" was floating around years ago. Laying all that pipe would be expensive. Pragmatic people must have felt it would still be cheaper for houses and businesses in Bellingham to have their own furnaces, rather than piping the waste heat from Intalco. That was pipe dreaming in years past. Pipe dreaming about the long pipe from Intalco. I love pipe dreaming, but using the existing co-generation plant for our brand new waterfront seems more practical. I wonder if this hot water is even being discussed as an asset in our waterfront's attempt to lure new uses to the area? I've done some looking around on the web, but haven't found much. Been to some waterfront meetings, but didn't think about this idea until more recently. Where's the meeting when you need it? I know a few people who have talked about this possibility. Some people might think there is a conspiracy to turn the working waterfront into a "yuppie tourism wealthy condo / luxury yacht world." Oh, well. I am not that much of a "conspiracy theory person." What ever plans fall into place, or are pushed into place (however one looks at this), here is something to consider. Power plants are just about my favorite destinations when I am a tourist. So, it can be both a "people" and industrial waterfront. See my images of Grand Coulee Dam. Maybe Bellingham's waterfront can become a showcase for co-generation and district heating? Toward bottom of article in February 1 2011 Bellingham Herald is news about studying the use of waste heat from power plant to heat parts of downtown Bellingham, Western Washington University or new development when it is built at old Georgia Pacific site. Also toward start of that article is thinking about a small hydro power project at at end of industrial water pipe which comes to old Georgia Pacific site from Lake Whatcom. Put windows in the co-generation plant? Like they have in the steam heating plant at Western Washington University. This plant could be run using local biomass such as chipped pallets tree trimmings and forest waste (slash piles) by adding a gasification unit upstream of the burners. Green heat and green power for the new development.